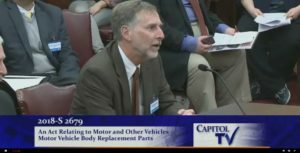 Yet again, a member of the auto insurance industry attempted to suggest that an “industry standard” is a comparable substitute for OEM repair procedures, this time during a Rhode Island Senate Judiciary Comittee hearing. The assertion is absurd. The three major auto body repair trade associations seven years ago pronounced the OEM repair procedures to be the standard of care. I-CAR, which is advised, supported and run in part by the auto insurance industry, has for a similar time period declared automaker repair procedures to be “service specifications” and the way to fix vehicles. The courts agreed, famously with the John Eagle Collision verdict in 2017. And yet here’s the auto insurance industry — not the guys building or fixing the cars — suggesting some other magical equivalent exists out there. It’s irresponsible, given the potential harm to policyholders in Rhode Island and elsewhere shops deviating from tested, proven repair instructions would cause. There seems to be no reason to cling to this incorrect position other than to duck paying for legitimate, clearly necessary repair procedures. Rhode Island Senate Bill 2679 would extend the state’s parts choice law to third-party claims, increase the duration for that choice and open up a wider range of parts to the law. He said I-CAR “sets standards for repair of cars, widely accepted in the industry” and any difference between I-CAR and other repair manuals “should be a discussion with the repairer” so the vehicle was fixed properly. Jina Petrarca, who was representing Providence Auto Body in support of the bill, explained to the committee later that I-CAR also says to follow OEM repair procedures. The insurers that don’t “need your action in order to do the right thing,” she told the committee. She said it didn’t take much thought to conclude that the manufacturer who built the car knew best how to put it back together. Suglia said Amica also had a problem with the bill mandating insurers to appraise vehicles based on OEM repair procedures but not forcing shops to follow the repair procedures. He said “shops should have that requirement” too as this was a consumer protection bill. “We certainly would not be opposed to that,” Petrarca said during her testimony.